Stage dimensions and features are typically dictated by the performers or presenters that will be using them. Be sure to check with them to find the minimum width, depth, and height, as well as their need for stairs, guard rails, or skirting(these items are rented separately). 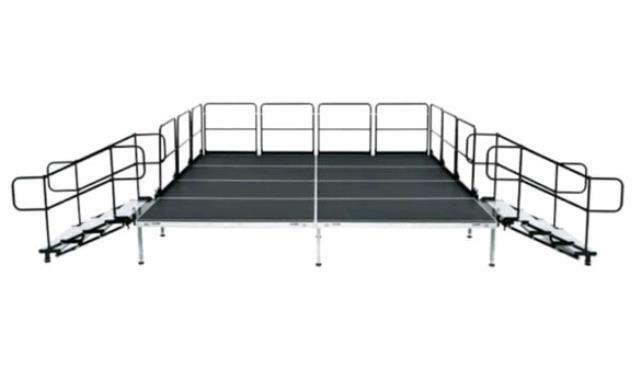 Stages are comprised of a series of 4'x8' decks which are made of aluminum frames and black polyripple tops. Stage height is variable and can be set as short as 8", or as tall as 48". Additional charges apply for heights of more than 30". Please specify what height you need when placing your order or quote. Labor to set up and take down is included in this price, but the mandatory delivery fee is a separate charge that is based on delivery zip code. These stages are only for INDOOR use only. Also recommended for events such as weddings and conventions. * Please call us for any questions on our conference indoor stages in St Petersburg FL, serving Clearwater, Gulfport, Pinellas Park and the Tampa Bay Area.